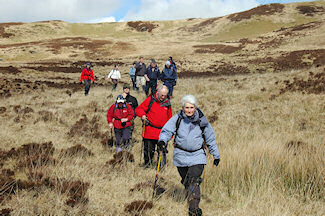 The walk took us down to the Sound of Islay, through Glen Logan and returning past Lossit Farm. We saw three Golden Eagles, an Otter and many sea birds. 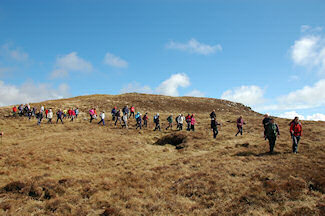 We waved to the ferry coming in with more walkers and had a great lunch at the An Claddach bothy. Not to forget the great pancakes afterwards, many thanks to DJ's family as well for their hospitality. On Sunday Lindy from Bunnahabhain and Karen (who runs Islay on Foot) took us to the hills in the north east of Islay, in particular to the summit of Giur Bheinn. Not as much wildlife on display during this walk, but the weather certainly held up and we had quite a lot of sunshine and mild temperatures. 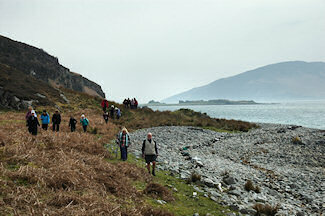 47 walkers joined this walk and upon our return we were welcomed by John MacLellan and a wee dram of Bunnahabhain. Finishing a walk at a distillery seems a good idea. Today unfortunately the weather broke down for a large part of the day: Quite a lot of persistent rain, so much that even I gave in and took my rain cape out of my rucksack. 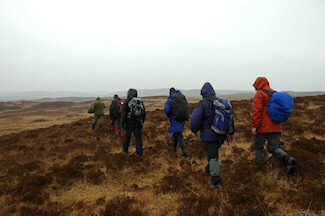 Still several well attended walks took place: 28 walkers took on the Bholsa and Rhuvaal challenge, 30 walked on The Oa and a smaller group of 9 (including me) crossed Islay from Loch Indaal to Loch Gruinart. Jack Adamson again did a fantastic job in guiding us through difficult terrain and finding spots sheltered from the wind and rain. It did clear up in the afternoon and we now have some lovely late afternoon sunshine, hopefully a good sign for the next few days. That's all I have for today, there are a few more (and larger) pictures on the Islay Pictures photoblog if you're interested. I'm off for some seafood at an taigh-osda now, looking forward to it!